Every so often, an M&S item comes along that sparks a shopping frenzy in fashion circles—the pink Roksanda-esque dress this summer, the fluted-sleeve jumper, that pink coat, the suede midi skirt Alexa Chung and Olivia Palermo wore (we could go on and on)… But this season, it looks like the star buy was a constellation-print dress with a pleated skirt and long fluted sleeves. The dress dropped in September and sold out quickly, but today it's back in stock in all sizes. 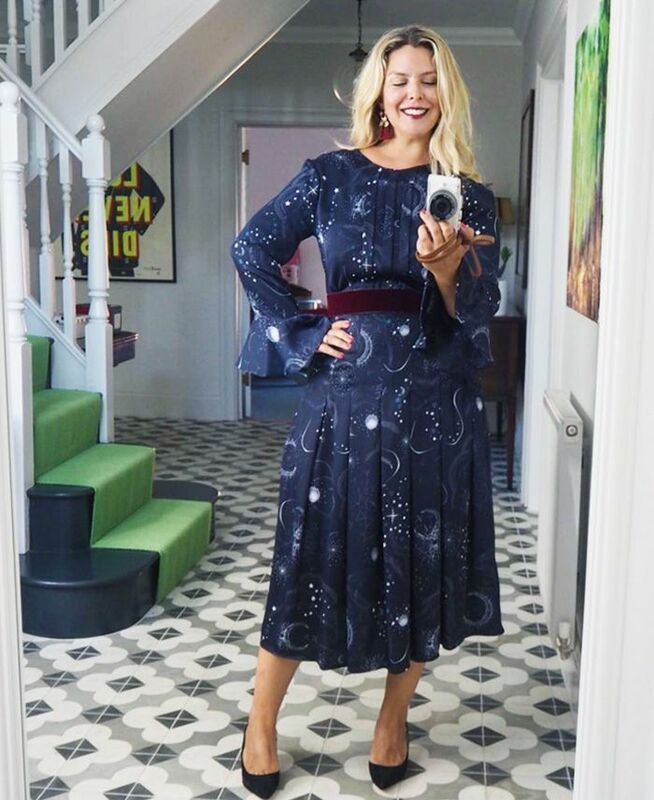 The dress took over Instagram — fashion blogger Erica Davies wore hers with a red-velvet belt and tassel earrings and Alex Stedman wore hers with silver sequin Mary Janes. Buy it now and you'll thank yourself during party season. Oh, and the best part about this dress is the under-£50 price tag. Scroll below to see and shop the M&S midi dress. Style Notes: Erica Davies pairs her dress with a red velvet belt and red tassel earrings. Style Notes: Alex of The Frugality pairs her star print dress with sequin silver shoes and a velvet bag. Next up: 11 dresses that no one will believe are under £50.